On intune MAM scenario ,user trying configure outlook/teams/onedrive app on android device to access corporate resources. Device already has company portal app which is broker app for android and authenticator app for iOS. If the user doesn't have broker app installed on android device when trying to authenticate for the first time ,(the broker app can be either the Microsoft Authenticator for iOS) ,user will be redirected to store to install broker app. When user launch the outlook app ,it prompt with the following screen .This happened because user was using the outlook app managed by intune earlier . 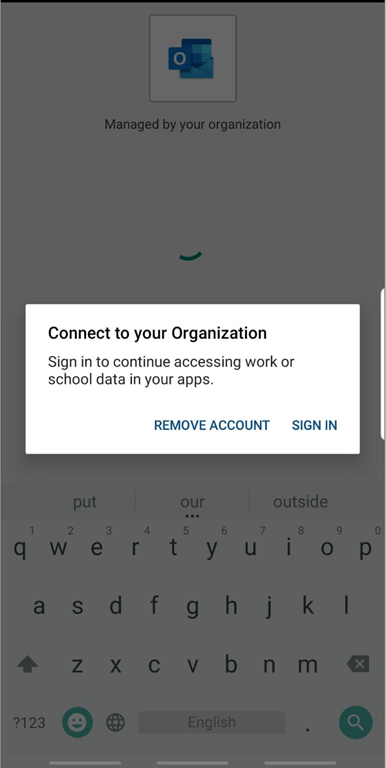 Error code: connect to your organization , Sign in to continue accessing work or school data in your apps. When user click on remove account ,nothing happens ,so user choose option sign in and it takes to sign-in page. User key in email address and password ,once authenticates with Azure AD/ADFS ,it send MFA (if MFA enabled) and after the approval of MFA ,it goes back to the same page like above. User cleared the cache data from outlook app and also from company portal app and tried configuring outlook , but doesn't work. User tried to configure other apps like teams,onedrive etc but still getting the same error. Since this is MAM scenario ,have no control on device and the only option is to guide user with possible options to fix the issue. Remove the brokerage app (company portal ) on your android device and install it again from paly store. Once this is done, user can Launch outlook/teams/onedrive or any other intune managed apps ,it take you through the device registration process and able to access the apps successfully.